Right about Wednesday of last week it occurred to me. Oh yeah, I have a wedding to finish planning. Somewhere in the middle of trying to close on a house, move, and furnish said house wedding planning got put on the back burner. But, I am back in full wedding planning mode with as dash of house business on the side. We still need to make sure that the house is ready to accommodate our out of town wedding guests plus, I'm anxious to get our house together the way I want it. The first thing I did is write out our wedding ceremony script. A bridesmaid's husband will be our officiant. As an "officiant virgin" he has no idea what to do so it's up to us to get everything mapped out for him. I cut and pasted wording from a variety of different websites and added some of my own writing to round it out. I want the words to be meaningful and make a statement about love and relationships-the very reason we are standing there in the first place. I'm pretty happy with the way it turned out. Mj and I will each write our own vows to each other which we won't hear until the moment we say them at our wedding. 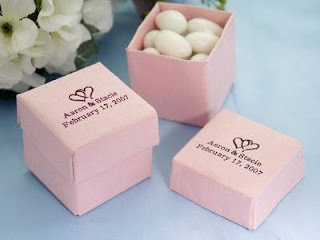 Next, I ordered our black silk flower petals and our wedding guest favors from efavormart.com. Originally, I was going to do bookmarks but when I saw these cute little pink personalized boxes for $39.99 I decided to get them instead. I found a 5 pound bag of pink candy hearts to fill them with from candywarehouse.com for $19.50 for a grand totoal of $60.00. There are 1,100 pieces per pound so I'm thinking that will be PLENTY. The 500 black silk flower petals were only $4.99 and they will be used to scatter on tables around our centerpieces. I already bought some pink one's at Michael's along with larger good sized round vases, LED lights, and pink stones I needed for my DIY centerpieces. Aside from the carnations those are ready to go and should run me about $80 dollars total. I'm glad I took the time to do most of my research on what I would need months ago because now as we get closer to crunch time all of the information I need is right there waiting for me. Not only do we feed guests at our wedding we also have to feed folks the night before after our rehearsal so I'm looking for rehearsal dinner locations that won't break the bank. We are going to have to limit numbers. I would like to include everyone who comes from out of town but that may not financially feasible so we will have to see how we can work that out. I am definitely looking for something casual and inexpensive. We can save the formalities for the day of. I picked up two very important items as well. My dress and my rings. The dress still fits after alterations which is a good thing and I still love it as much as I did the day I picked it out. Actually, I wish it were just a little bit tighter. I am nervous about being in a strapless and feeling the need to tug it up all night. I am wearing a regular strapless bra but I might shop around for some other options. It's nice to have a place to actually put this massive dress now that we have extra closets. And my rings are beautiful! All three of them. I will be scrambling this week trying to track down black pin on flowers for my bridesmaids to wear on their dresses from David's Bridal. I figured I would just get them and it turns out they are pretty scarce and if David's orders it I won't have them until after the wedding! My bridesmaid from Georgia tracked one down there and now I just have three to go. I also need to add our officiant to our tux order since he wants to wear a tux for the ceremony. Apparently no one is even coming to this little shin dig I've been planning all year. Tracking down RSVP's is also on my to do list for the week. I am back into wedding planning mode and ready to take it all the way to the finish line which incidentally is IN 34 DAYS. Time really snuck up on me but I'm in a good place to pick up right where I left off and get things done. Wow all your ideas sound so great and well, frugal. Your favors worked out to a really good price. 34 days! I am so happy for you! Enjoy the journey! Love the pink boxes. I had to track down rsvps too. It can be such a pain, and I only invited 38 people! Girl, RSVP's were the death of me! I just don't get people...send the card in folks! Those candy boxes look so sweet and cute! Good choice. Wow..I so looking forward to see your wedding photographs. Good luck for your planning!